For all you warriors against Agenda 21 who stayed in the fight in spite of being called conspiracy theorist by those who are now waking up, THANK YOU. Subscribe • Forward to a friend • Email not displaying correctly? View it in your browser. 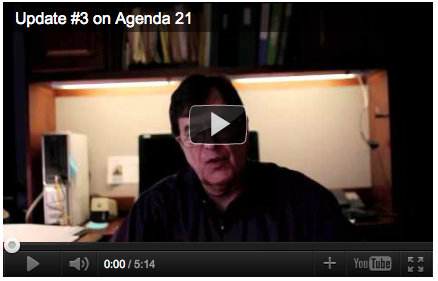 Agenda 21 is a Real Threat! I have some astounding – exciting news to report to you. After 18 years of fighting, APC’s efforts to stop the UN’s Agenda 21 has just received an amazing boost! Because the Republican National Committee (RNC) just UNANIMOUSLY passed a resolution opposing Agenda 21! That means that our fight is no longer hidden from the main stream of the American political debate. It means no longer can our opponents succeed in labeling us “fringe conspiracy nuts” as they have tried so hard to do. One of the two main political parties in the United States of America – the Republican Party – just said Agenda 21 is a treat to our freedom! This is a huge victory. And it is energizing our activists across the nation. It means we can now use this resolution as a weapon against Agenda 21. It means Republican elected officials, from Congress on down to your city councilmen will be much more willing to listen to our protests. But, of course, the battle is far from over. You and I must use this new weapon effectively. We must demand that Republicans at every level be pressured to support the platform of their party. That’s why it’s urgent that you sign the enclosed Petition to Speaker of the House John Boehner urging him to oppose any Agenda 21 legislation that comes before the House of Representatives. The petition includes the exact language used in the RNC resolution. Speaker Boehner is the highest elected Republican office holder in America. He leads all policy decisions that come before the House. He is the man who can block Sustainable Development grants, comprehensive development schemes, energy controls, and federal land grabs – all part of Agenda 21. For the past year APC has been gaining success in waging battles against Agenda 21 in city councils and county commissions, helping more than 54 communities to end their memberships with the International Council on Local Environmental Initiatives (ICLEI). And we’ve started to have some success in state legislatures as well. Now for the first time we have the opportunity to take the battle to Congress because the Republican Party – on a national level – has taken this action to officially oppose Agenda 21. It is now our duty to take up this courageous action by the Republican National Committee and use it to apply pressure on Congress. So please, today, right now, sign your petition to Speaker Boehner and it will be instantly emailed to him. Every Republican office holder in the nation must be made to toe the party line – starting with Speaker Boehner! Your signed petition is the first step. Sign your petition here. And please, as you send your signed petition please also include your most generous contribution to the American Policy Center. APC is the recognized leader in the nation in the fight to stop Agenda 21. 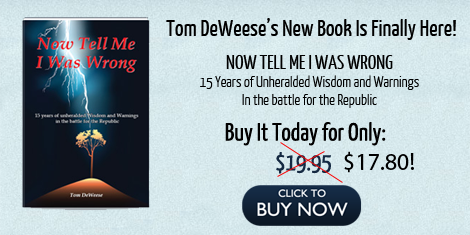 I must have your continued financial support to win this battle for American liberty. Without your support I can do nothing. Every dollar counts. If you want to make a contribution that makes a difference then your dollars to APC is your best investment. APC is scoring victories in a battle they said we could never win! So please sign your petition to Speaker Boehner and make a contribution to APC today. I’ve never been more energized or more convinced that we will win. Your support is making this possible. P.S. The best way you can help APC financially is to pledge a monthly contribution of $10 or $15 or more. That gives me a guarantee of income and helps me through the lean months. And it helps me plan our battles. Whatever you can send is vital to our efforts. Thanks so much for your loyal support. Click here to make a donation. Corruption and Sustainability: Like Oil & Water Do Not Mix--Wrong! You are receiving this email because you opted in at americanpolicy.org, deweesereport.com, or by mail. Copyright (C) 2012 American Policy Center All rights reserved. Currently in the state of Virginia, if a woman is incarcerated in our prison system and goes into labor she may be restrained and shackled during the whole childbirth experience. This practice is not safe for the health of the pregnant mother, nor the life of the unborn child and must be overturned. · The American Congress of Obstetricians and Gynecologists, the American Medical Association, and the United Nations have condemned the practice of using restraints on pregnant prisoners, citing the serious health risks posed to the mother and infant. · Eli Adashi, a professor of medical science at Brown University and member of the Center for Prisoner Health and Human Rights, said the health risks grow with each advancing stage of pregnancy. · The challenges of restraints become more urgent in the delivery room, where it’s vital for a woman to move around early in labor to appease pain and expedite delivery. Should an emergency arise, including the need for a cesarean section, precious seconds are lost uncuffing a woman, potentially preventing a doctor from delivering necessary care, according to Maureen Phipps, Associate Professor of Obstetrics and Gynecology at Brown University. · Restricting the use of restraints on pregnant prisoners will not jeopardize the safety of correctional or medical staff. Among the states that have restricted restraints on pregnant inmates, none have documented instances of women in labor or delivery escaping or causing harm to themselves, the public, security guards, or medical staff. We need your help! Currently, there is an introduced bill (HB 836) that bans hard restraints on pregnant inmates during labor, transport, delivery or postpartum recovery except in the case of extenuating safety circumstances. This bill would codify action taken this past fall by the Virginia Board of Corrections in which the Board voted unanimously to restrict the use of hard restraints on pregnant prisoners. The bill allows for an assessment by the jailer that if the pregnant inmate is a flight risk or may pose serious risk of harm to herself or others she may still remain in shackles. Prior to the regulations going into effect, they must undergo a thirty-day public comment period. Please visit the public forum and post your comment in favor of restricting the use of shackles on pregnant prisoners. It is important to have a strong presence in the public forum to signal support to the Board of Corrections. Please click here to post your comment. This is such an important issue; the proposed regulation has garnered support from a diverse coalition: the Virginia Catholic Conference, the ACLU, Planned Parenthood, and Prison Fellowship. After 18 years of fighting, APC's efforts to stop the UN's Agenda 21 has just received an amazing boost! It means no longer can our opponents succeed in labeling us "fringe conspiracy nuts" as they have tried so hard to do. That's why it's urgent that you sign the enclosed Petition to Speaker of the House John Boehner urging him to oppose any Agenda 21 legislation that comes before the House of Representatives. For the past year APC has been gaining success in waging battles against Agenda 21 in city councils and county commissions, helping more than 54 communities to end their memberships with the International Council on Local Environmental Initiatives (ICLEI). And we've started to have some success in state legislatures as well. I've never been more energized or more convinced that we will win. Your support is making this possible. So sorry the subject line was incorrect. Bogus Reports of EPA and Science Community regarding man made climate control, rezoning and The Endangered Species Act, global warming have been use to steal property from every area in the US. Property rights are one of the most important rights in America as it give individuals equity in their country. American is the richest land mass in the world with huge mineral, oil and coal reserves. Join Sai and I to discuss how Agenda 21 destroys communities. Sri 3:15- 3:45 EST, 2:15 - 2:45 CST http://westorlandonews.com/2012/01/20/soil-and-water-conservation-in-florida/ Running for soil and water conservation. Comparison of socialism in India to socialism in the US. RE: American Freedom Watch Radio, Jan 24/PLS BOOK THIS MAN!!! Operation Paul Revere is our Plan for Action. When you read this newsletter, get your Gadsden flag post cards ready and send them out. Americans, if not now when?. Breaking News: Tonight Gaston County Commissioner’s unanimously passed resolution condemning Agenda 21! This is an email I received from Cheryl Pass with the Gaston Tea Party. This is very good news. Hope we can get our Cleveland County Commissioners to do the same. Report from Gaston County Commissioners meeting tonight: Not sure what I was expecting...maybe balloons and champagne flutes for all, choirs and bands, the heavens full of shooting stars. Well, you all know me, I like visual impact and lots of celebrations for good events. Even so, our great commissioners passed, unanimously, the anti-Agenda 21 resolution for Gaston County as part of their consent agenda this evening. There were no dramatics. No arguments against it. The deed is done. The Gaston County Resolution against Agenda 21 is heading to the NC State House for recording. The Chairman of the Commission told me afterwards that he has heard from several other county commissions in the state who are interested in looking into doing this same thing for their counties. So all in all, a very good, albeit quiet, passing of one very important statement. I want to remind my friends on this issue that this is just one step. The hard work of weeding Sustainable Development and Smart Growth, AKA Agenda 21 out of our lives is just beginning. Don't give up! Cheers to all of you! CONTACT your Representative in Tallahassee. CALLS, POSTCARDS. ILLEGAL'S DO NOT VOTE. YOU EITHER STAND WITH AMERICANS, OR YOU STAND WITH ILLEGAL'S ! Don't Forget! Agenders Conference in Orlando Feb. 4 Register now. Can you volunteer to pass out flyers in your neighborhood. Can you hand out 10 a day? If you can't not to worry, the Obama Team will. The won the election that way. Make a flyer from this email. Get it out in your neighborhood. contact Brenda for information on advertising and producing your own show. Agenda21today.com. has new pages. Check out the store. Agenda 21 is the United Nations plan to destroy a free America. All Federal Agencies now answer to the United Nations. Their desire is establish a New World Order with a One World Government controlled by the ELITE from the United Nations. Join us at the conference and visit our web site which will change continually. Your Donations keep us going. $5, $10, $20 any amount is greatly apprieciated. Thank you, AgEnders.